We made the move to Southern California a little earlier than planned so Dianna could be here when her Dad has some more surgery for skin cancer. The original plan was to be here the first of April, but we made the move on the 19th of March instead so she could help with pre-op appointments. Finding a reasonably priced place to stay in Southern California is always a challenge, and since are not spending the summer volunteering at San Onofre this year we had to find a different place. Our plan is to stay around here until early June, then begin our trip toward the east coast. After considerable searching we found a mobile home park that looked like it would be a good choice. It is located in Frazier Park, a mountain community about 45 miles north of Dianna’s parents. It is half as far to her folks house as we were in San Onofre, and the price on a monthly basis is quite reasonable. The mobile home park itself is located at 5,200 feet in a pretty valley. We arrived during the early afternoon and finally found a site that had a 50 amp power plug, which our rig requires if we are going to use our heat pumps for heating. Heat pumps are about three to four times as efficient as using propane or resistance type electric heaters, and we knew we were going to need heat. What we didn’t know is how much. The mobile home park is actually located between Frazier Park and the little community of Lake of the Woods. It is only about two miles up the road and 600 feet higher than Frazier Park (whose weather we had been watching and using for planning) but it turns out that because of the bowl it is located in, the night time temperatures are about 10 degrees colder. The very first night the temperature dropped to 24 and it has been well below freezing every night since! Daytime temperatures have rarely exceeded 60. Freezing temperatures cause several issues. First of all, I can’t leave the water line hooked up, so we are having to fill the tank on the trailer and use our own pump. That’s not a big issue, but just a hassle. Second, our heat pumps only work down to about 34 degrees. This means that we will have to use a lot of propane to keep warm. Propane here costs $3.75 a gallon compared to $2.50 a gallon in Yuma and Quartzsite, and we will burn at least $35 dollars worth a week when the heat pumps can’t be used. Then there’s the hassle and cost of taking propane bottles several miles down the road to be filled every few days. The less often we have to do that, the better. After plugging the trailer in and firing up the heat pumps, we immediately discovered we had another issue. The power in our site is very poor. We have a power monitoring system installed in our rig to check for things like high and low voltage, and for wiring problems. It immediately became apparent that we had a low voltage problem. In fact, the voltage was so low that the monitoring system cut the power off so we would not cause damage to our heat pumps. We had the park electrician check it out, and he did find some problems that improved the power a bit, but not enough. I think the park is just too old and has wiring that was not sized for today’s RV’s. I felt I had no choice but to purchase a special transformer that monitors for low voltage, and automatically steps it up. These transformers are used by many full time RV’ers because this problem is not that uncommon. In fact, I already have such a transformer and have used it previously, but it is only a 30 amp model. We need a 50 amp model for the amount of power we will be using here. I found one on sale on line, and ordered it Thursday morning. FedEx delivered it Friday afternoon. I installed it and problem solved. Unfortunately, these things are not cheap. $550 is a lot of money, but still much cheaper than replacing a heat pump with a burned out motor. Meanwhile, as soon as we arrived we discovered that cell phone service here is almost non-existent. We were able to connect very briefly at times, and soon found that only those of us on the highest row in the park were even able to do that. We have had spotty cell service in other locations where we stay, so we decided it was time to do something about it. I checked with several other RV’ers and learned about external cell phone antenna’s and amplifiers. Sometimes only an external antenna is needed, but usually an amplifier is also required. And, only certain cell phones have the RF port where an external antenna can be plugged in. I ordered the best antenna I could find, along with the adapter to attach it to our Motorola RAZR phones. Fortunately our phones were on the list of those with RF ports. Unfortunately, it turns out that the RF port is the most delicate and poorly designed of any phone out there. It is really more of a test port used during manufacture. After playing with the phone and antenna adapter for several hours it was apparent that it was not going to work, and even when it was attached the signal strength was no better. After consulting with some experts I came to the conclusion that the only option was to order an amplifier and get different phones. Yesterday we made the trip to Bakersfield, a little closer than the LA area, and a whole lot easier drive. It is only about 45 minutes to a shopping area with all the stores we care about, including a Super Wal-Mart and a Costco. We went to the Verizon store to find new phones. We were eligible for our “free every two years” phones, but finding phones that met our needs was not easy. Although we have thought about getting fancy phones, like a Droid, we just can’t justify them. Not only do they cost a lot more to purchase, they also would require us to add data services and increase our monthly cost as well. While they would be a fun toy, it just does not make sense in our situation, especially when none of them will meet the external antenna support requirement we have. So, we purchased (got for free) new Samsung flip phones that essentially do nothing different from our RAZR’s. In fact, they are even less capable in some ways. For example, they do not take videos like our RAZR’s did. Of course, that’s something neither of us ever did, but it is a little discouraging getting a new phone that is no better than the one you are replacing. Also, they will also need new car chargers and Dianna will want a new carrying case. Oh well, they will meet our needs for communications, and that is the important issue. So, here we are, sitting in a place where the temperatures will require us to spend far more on heating than we anticipated, where it is too cold to be outside much of the time doing things like geocaching, where we have had to spend $550 for equipment to clean up their electricity, where we have had to replace our cell phones and spend over $350 to make them work, and where when I checked the weather forecast this morning, I discovered we have a winter storm warning for the last half of next week. Six inches or more of snow is predicted for here! What have we gotten ourselves into? We decided to spend another day in the western part of the park so we could do a few more hikes. They were all relatively short. 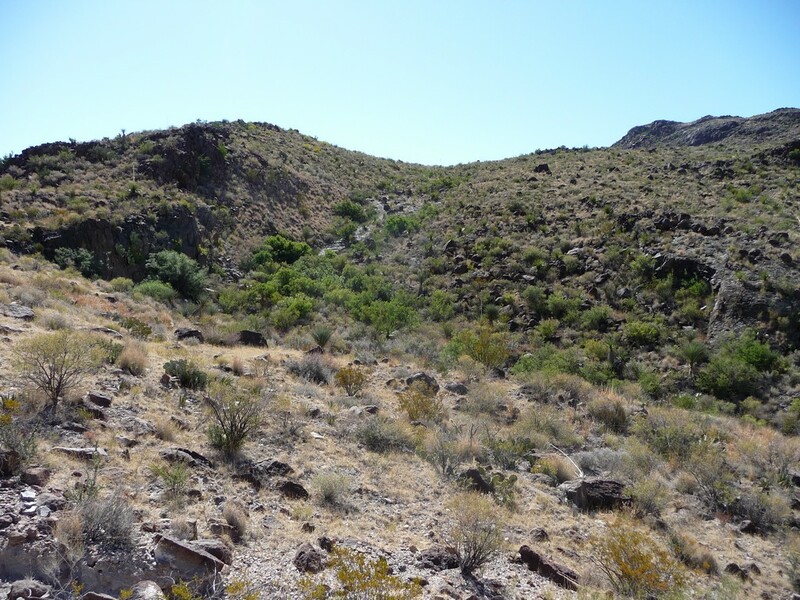 First we rode up to the Burro Mesa turnoff and parked at the Burro Springs Overlook Trail. Information about the trail was not posted on the sign but it looked like it was just a short hike to an overlook. We didn’t even take water with us as we thought it would only be a few minutes. Wrong. It turned out to be 3/4 of a mile each way to a rather disappointing view of some greenery in a small canyon. We then rode another mile or so up the road to the parking area for Burro Mesa Pouroff. Pouroff’s are places that would be call falls if water continously ran over them, but they are dry except when it rains. It is a spot where water that falls on Burro Mesa during a rain storm “pours off” the mesa. The hike was less than half a mile each way, and the formation itself was interesting. 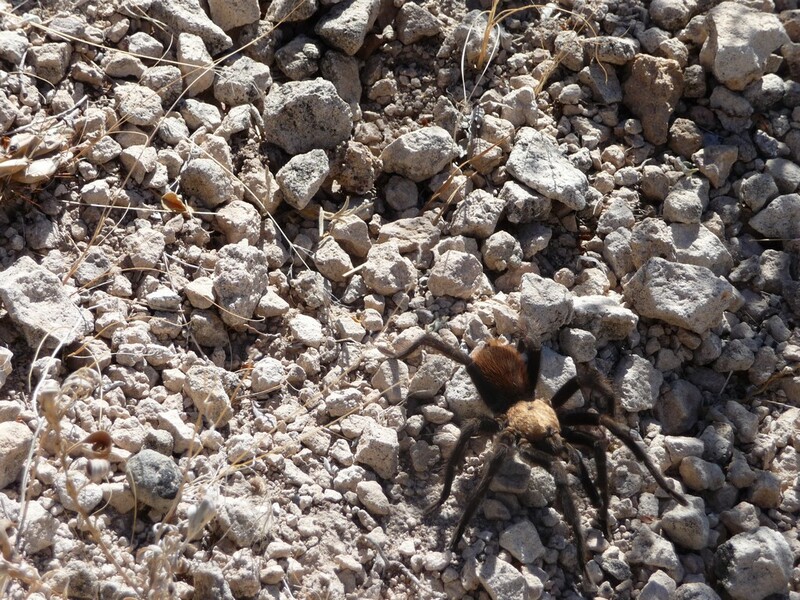 On the way back to the scooter we saw a tarantula crossing the trail. 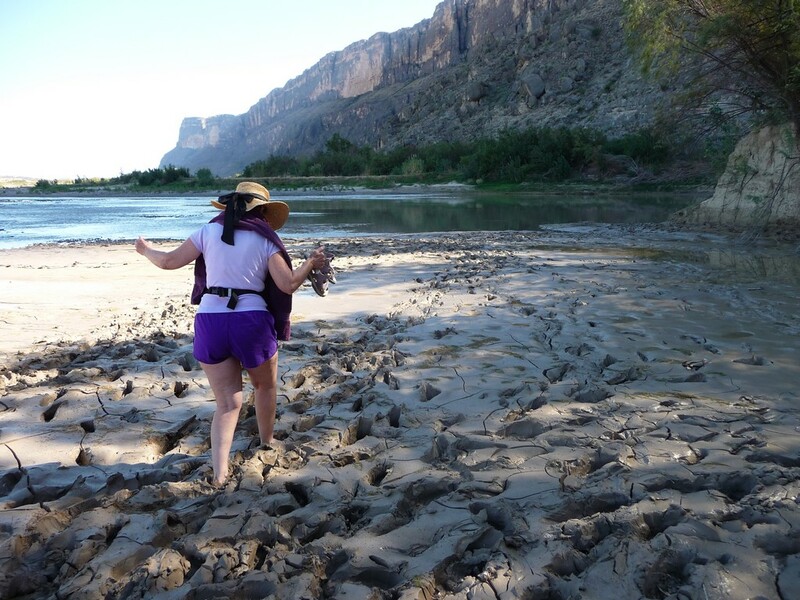 We then decided to try the Santa Elena Canyon Trail again. When we were there a couple days ago the water levels were so high that it was not possible to cross Terlinga creek to get to the start of the trail. The water levels had gone down some so we figured we had a chance. When we arrived we watched as some European tourists waded across the creek in knee deep mud. It looked like it was time for some adventure so we followed suit. Yuck! 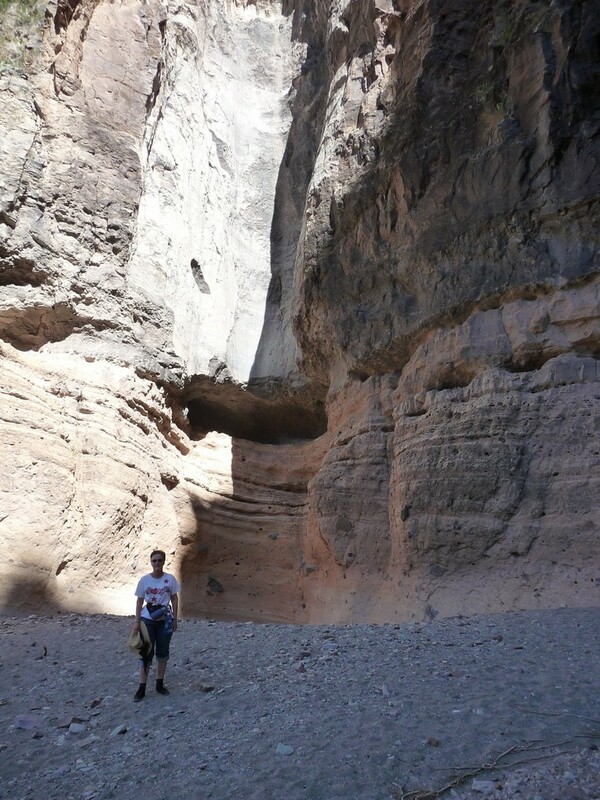 The canyon itself was very narrow and the hike was cool and pretty. We watched several river rafters as they floated past. 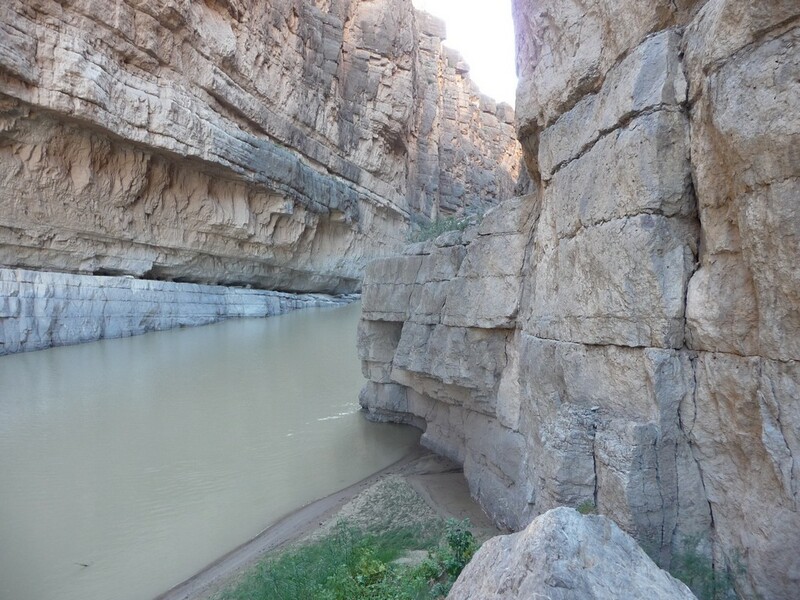 The canyon itself is about 8 miles long but the trail ended in about half a mile where the canyon rock walls drop all the way to the river. It is strange to think that the walls on the other side are in Mexico. On the way out we met some other hikers who had found a rope attached to a tree farther up Terlinga Creek where you could pull yourself up the 10 foot sheer embankment. We searched it out and used it to get back with dry feet, although Dianna needed a little help rappelling. Three hikes in one day was plenty, especially because it was quite warm. But we had a good time. Wednesday was move day. We relocated to the Rio Grande Village Campground on the other side of the park. After setting up camp we did laundry and then settled in for a few days of exploring this side of Big Bend National Park. We decided to spend a couple days at an Escapees RV park between Artesia and Carlsbad, NM. Today we went to Carlsbad Caverns since it has been a few years since we were there. We always enjoy caves and Carlsbad is about as good as it gets. We hiked in the natural entrance and then rode the elevator up to the visitor center for lunch. Then we rode it back down for our stroll around the Big Room. We had a good time but three hours of walking on steep grades wore us out. Obviously we are out of shape again. So, what’s the good news and the bad news? When we got there I walked up to the counter and told the Ranger that I had good news and bad news. The good news is that I am now 62 and for $10 I get the lifetime Senior Pass that covers the entrance fee for me and up to three others to all National Parks, BLM parks, COE parks, etc. It also provides half price for most other fees like camping and tours. The bad news? I’m 62……………. Chris fell down & broke his crown…..
We just found out that during the ice storm last week Chris slipped on the ice when he went to retrieve their mail. His head bled a lot and he was knocked out for a few seconds. Dayna took him to the emergency room ….. very slowly & very carefully ….. and it turned out he did have a concussion. He has some memory loss from the day but it doesn’t look like it did any permanent damage, thank God. I guess it’s time to make a blog entry, although there is not a lot to talk about. We stayed in TN until the 15th and then drove home in one day. It is about 850 miles but the weather had turned cold and we did not want to sleep in the truck because it would have to idle all night. That is a lot farther than I like to drive, but the big truck is made for covering long distances. Since arriving home we have not been very busy. We have both gotten our Dr. appointments out of the way and I have finished a couple projects around the house, but nothing noteworthy. One of the interesting things about North Texas is that it is located where Arctic cold fronts battle with warm onshore gulf breezes and moisture. It results in wild swings in temperature during the winter. We have a few days of high 70′s followed by days when it does not get above freezing. This week we had one of the freaky weather conditions that happen occasionally. A front brought very cold weather on the surface, but with warm, wet conditions above the cold layer. The result is freezing rain when the drops fall through very cold air which causes them to super cool and flash to ice when they land. It results in an ice coating on everything. Yesterday we had such a storm. There were some icy spots in the morning, but by late afternoon it got worse and continued until about one AM. When these storms hit everything comes to a halt. Schools were closed yesterday and today. Almost everyone stayed home from work and we did not leave the trailer at all Monday and Tuesday. We finally ventured out this afternoon after the sun had melted the ice everywhere except some shaded underpasses. I have lived in winter climates and have no problem driving in snow. Ice storms are a completely different story. It is not even possible to stand up, much less drive in these conditions. If you have never experienced one, my recommendation is don’t. We plan to be here until the 23rd. We will make our way to Phoenix again for a few days, and then most likely out to the Quartzsite dessert. If Don and Betty can get away for a few days we may have a Lafferty Boondock Party. We are in Cleveland, TN to visit Darin and Diane for a few days. We brought our boat to him since we just don’t use it much anymore. It needs some work done on it that he will have to do before he can use it. I bought new tires before starting out (the ones on it were 20 years old) but he will have to do the rest. Much of the wood in the seats and engine cover has rotted, so he will have to repair or replace it. We both had Dr. appointments on Thursday. Dianna had her annual woman’s exam at her usual clinic, and I had my first annual checkup with the VA. They have a very nice facility in Denton and I was impressed with the care I received. The best part is that it did not cost me anything. Well, nothing more than 3 years of my life. We left Friday in the truck and spent the night in Jackson, MS at a Wal-Mart parking lot. Since we do not have the trailer with us it is much easier to find places to stay. Wal-Mart is a good choice since we can use their restrooms and there is always something we need to buy. We are parked in Darin’s driveway while we are here. I ran an extension cord to the truck so we can plug in and run the little electric heater to keep warm. It is cold today and not supposed to get a lot warmer for the next few days. It is supposted to get even colder in a couple days with lows in the upper teens. No fun. We need to get to warmer country, and soon! We’re off to the Jennings to celebrate Dominic’s birthday and to ring in the new year. I pray you all have a safe and fun evening, and a glorious 2009!